First impression is the best impression. If you have the pc or laptop we have the most user friendly Life Insurance software. We have the infrastructure and trained executives and engineers to give the best after sales service. 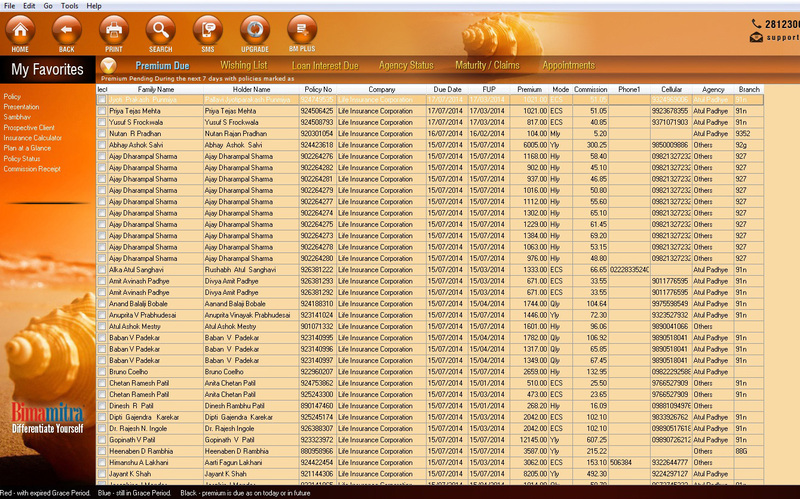 When you are buying life insurance software it has to be the most user friendly BimaMitra software package. Now state of art insurance management solutions is at your fingertips. Experience the ease and convenience of using the insurance software. Whether you are part-time or full-time Insurance Professional, you know that having efficient software is crucial to your credibility and profitability. Bimamitra is an advanced software solution that organizes and improves the productivity of Insurance Professionals like you. It is full of features that are designed to make your work load easier and more organized. And anyone who has been around the insurance world long enough knows that staying organized and on top of your business is one of the most important parts of the Client-Agent relationship. No more poring over manuals and online help menus. BimaMitra is so simple to operate that even a person with nil knowledge of computer would require an hour to understand all the requirements of the software. BimaMitra's auto fill feature is so unique that it fills data and details, which are basic to any policy automatically or the type ahead feature which eliminates the need to type complete details since BimaMitra completes the remaining. YES! With it's enhanced features it offers what you always wanted. BimaMitra software package has inbuilt details of all the insurance plans and the intelligence to understand the specific features of each plan. It is easy to import data and set it on your computer. Unique features of BimaMitra will provide a complete picture of families and automatically groups and segregates members of a family thus eliminating the tedious task of regrouping the members of the same family by you after the data is imported. We are aware of technology changing everyday around us, aware of computerization stepping into every aspect of our lives bringing with it's benefits and profits for those that have kept up with it. These varied insurance companies will surely be stepping in arched with the might of technology. The competition will provide the best professional presentations & services. The one with the difference will emerge as the winner.